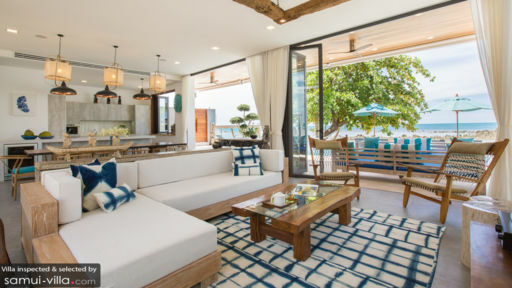 Overlooking the bay of Laem Sor in Koh Samui, Villa Suma is part of the luxury Pavana Group, home to excellently-appointed holiday homes curated to provide a wholesome, memorable, and elegant holiday experience. With six bedrooms and ample common spaces, the villa is great for families with kids, groups of friends and others. Stunning and panoramic scenery, infinity pool, and lush greenery are only a few of the gold trimmings on the gorgeous attire that is Villa Suma. Villa Suma has six bedrooms in total, spread across the two floors with three on each floor. The master bedroom is furnished with a king-sized bed and a 40” flat-screen TV, which you can enjoy watching from the comforts of your bed or the sitting area. The en-suite bathroom is fitted with a terrazzo bathtub for tranquil bubble baths. The other bedrooms are all furnished with king-sized beds, quality Egyptian cotton linen, and elegant décor. The bedrooms have en-suite bathrooms with necessary amenities for your convenience. The kids’ rooms are furnished with bunk beds and a play area for keeping them occupied and close to their parents! 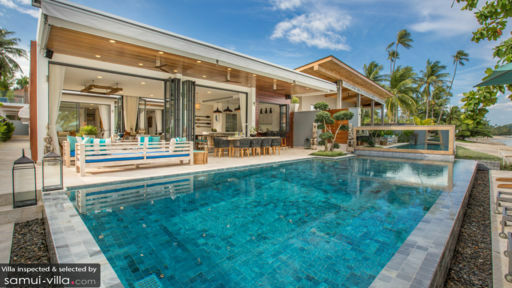 The villa is located over two floors, and the ground floor is where you will find the tropical living and dining areas, as well as the swimming pool. The 12-metre infinity pool is designed to overlook the sea so you can enjoy a tranquil experience as if one with the sea. There is a pool deck housing sun chairs, tropical plants, and Thai stone sculptures to decorate the area. There are sun chairs placed beside the beach as well, for a relaxing and chill time looking out at sea, taking a nap, or sunbathing. The courtyard divides the bedrooms from the communal spaces, and itself is sprinkled with a variety of plants and flowers for a beautiful outdoor area that comes alive in the tropical sun. A terrace is also found on the first floor of the villa which has been decked with comfy and plush sofas and lounge chairs from where you can enjoy the glorious view of the sea. The island-style living area at Villa Suma is an open-plan affair with direct access to the pool deck and swimming pool, also allowing a mesmerizing view of the sea in the distance. The room is decorated with several Thai artifacts including hand-crafted furniture, wooden designs, stone sculptures, vibrant wall hangings, hand-woven rugs and other such trinkets. The bright and cheerful room is where you can gather with everyone to have a good time. There are comfortable L-shaped sofas, armchairs, stools, and other furniture for lounging. A massive, flat-screen TV is mounted on the wall for your entertainment. For dining, the guests are spoilt for choice at the villa as you can choose to dine besides the sea, the pool, or indoors inside the living area. There are long dining tables with wooden chairs both inside and out, for an alfresco or a more cozy experience with loved ones. The state-of-the-art kitchen at the villa is fully-equipped and functional with all sorts of equipment and appliances for your culinary needs. Apart from the excellent décor and amenities, the villa staff is experienced and come from varied hospitality backgrounds to offer a great time to guests of the villa. The manager speaks English to make it easier to communicate your requests and needs. The Thai chef is all too happy to delight you with the best dishes to tickle your fancy, and a daily continental breakfast is included in your stay! 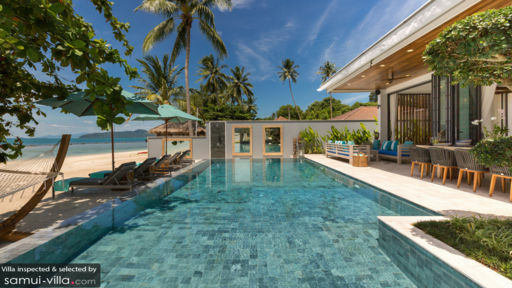 Located on the beach of Laem Sor, the villa offers guests a tropical haven with a minimum number of people frequenting the region so you have a chance to explore the neighboring villages, interact with the locals, and discover the many beaches. Lamai beach and Chaweng beach are both nearby so you can head out to the many restaurants and bars on the shores of the beaches.